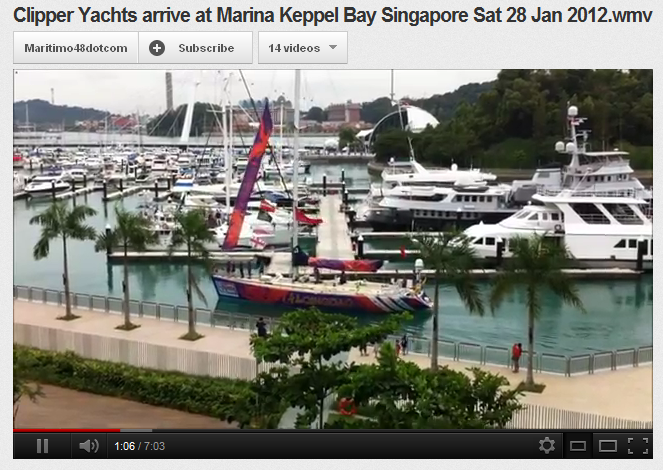 Listed on Yachtworld and available for inspection from Singapore. At 73 feet in length and very highly spec’ed this is a serious offshore Passage Maker or Coastal Cruiser. Capable of extended cruising without having to put into port thanks to large fuel capacity, great economy and an impressive list of equipment. Water Maker, Trash Compactor, Stabilisers, Gensets x 2 , Air Conditioning, Washer, Dryer, Hydraulic bow and stern thrusters and a walk in engine room to name a few. The full living and dining area of the Selene 66 is on the saloon level and is entered from the cockpit. Owners will enjoy three staterooms with crew quarters aft of the engine room and all staterooms have ensuite heads. The full width master stateroom is complete with a large ensuite, full length closets, and writing desk. 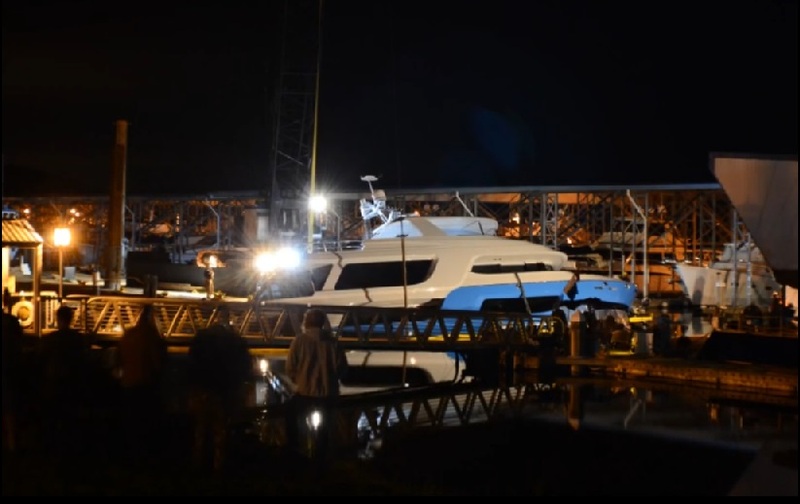 The flybridge can be accessed from the stairway in the pilothouse. The Selene 66 flybridge allows for extended deck space that can accommodate a large tender as well as a perfect platform to fish, dive and just relax on. Machinery spaces aboard are easily accessed through a transom door or main saloon and the engine room features full standing headroom up to 6’2”. All major components are within reach for ease of maintenance. In addition to clean engine room spaces, a massive lazarette includes washer and dryer units stored under a workbench. Like all Selene yachts, she features fabulous interior woodwork, exotic granite, a selection of glamorous draperies and fabrics, as well as high quality European lighting and interior fittings. She is designed for extended cruising in style, comfort and safety. 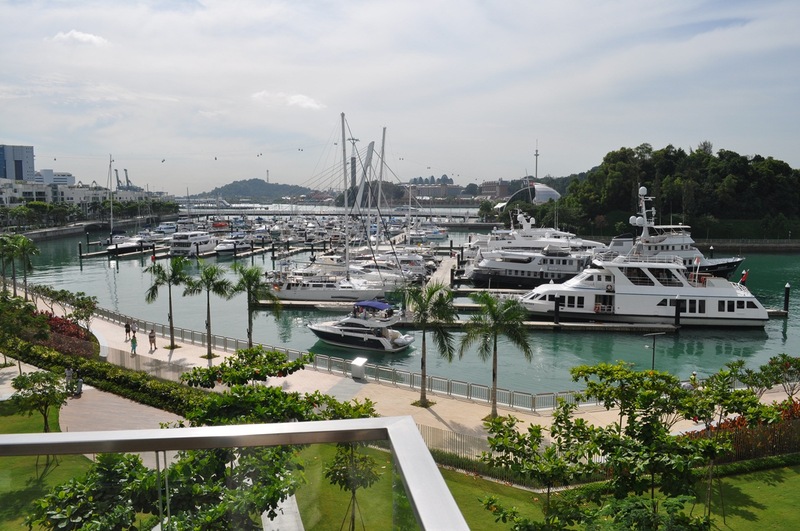 My Villa Unit in Reflections at Keppel Bay is now available for Sale with Vacant Possession Two Year Teanancy Agreement expiring Aug 2017. 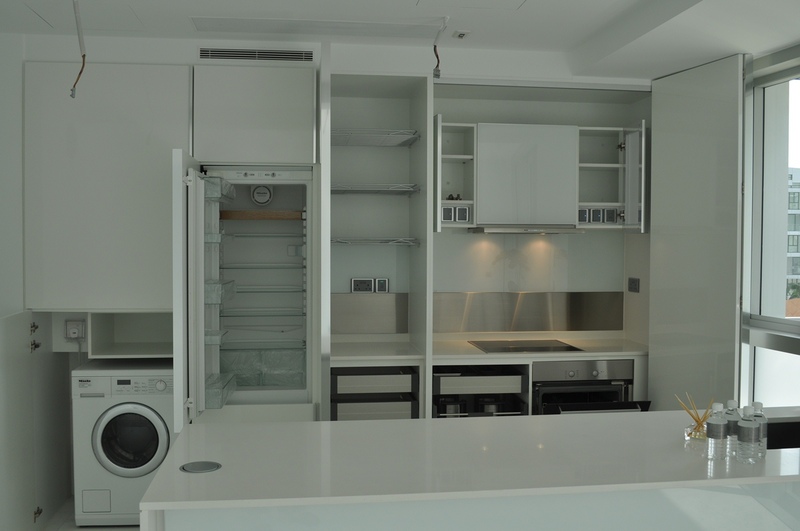 If you are interested to rent or to purchase the unit please get in touch by leaving a comment and I will respond back to you. The Local Sabahan Guides were Hero’s. The Government Rescue response was a farce. 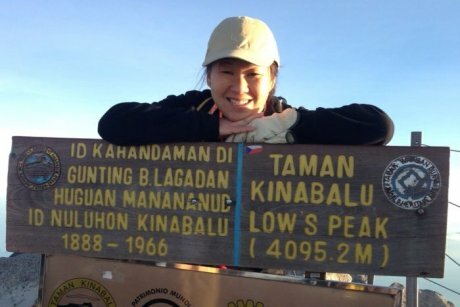 Australian woman Vee Jin Dumlao was stranded on Mount Kinabalu after an earthquake that killed 11 people. 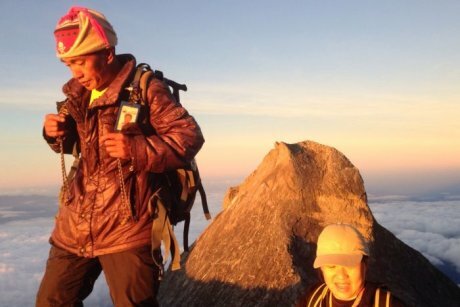 Australian climber Vee Jin Dumlao was atop Malaysia’s Mount Kinabalu when a magnitude-6.0 earthquake hit. When her group was left stranded by rescue officers, they decided to make the perilous journey down themselves. It was supposed to be a quiet dawn climb. 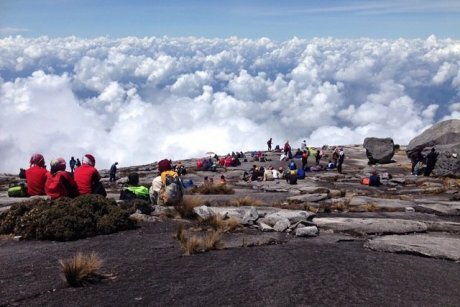 Leaving at 2:30am for the top of Malaysia’s Mount Kinabalu, Borneo’s tallest mountain, a group of 137 climbers — including two Australians — reached the peak’s granite plateau at dawn, and had expected to be back at Laban Rata for breakfast. But at 7:30am, that plan abruptly changed. “We had just completed the ascent to the peak, and [we were] making our descent, taking some photos when we heard a loud crash, and felt the ground shaking,” Vee Jin Dumlao, a clinical psychologist from Sydney, told the ABC. Though Ms Dumlao felt calm at first, panic set in when the group was told that the magnitude-6.0 earthquake that rocked the mountain had destroyed their route back. “When our guide took our empty water bottles to be refilled, at perhaps 1:00pm … they came back with news of massive landslides and the route having been decimated and no certainty of rescue,” Ms Dumlao said. Photo Climbers sit at the peak of Mount Kinalabu, moments before a major earthquake. 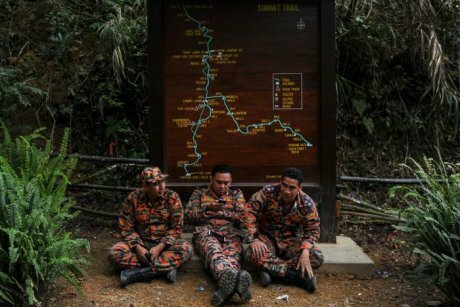 The Malaysian rescue officials said they were making an effort to reach the climbers, but could not land a helicopter due to poor weather. “Fog was quoted as the reason for not rescuing the climbers, that was certainly true earlier in day,” Ms Dumlao said. “However, around about 3:30pm the sky actually cleared right up, from ground level up to the mountains and that’s when we thought there’s nothing stopping them now from coming to get us. Despite the clearer weather, the climbers and their guides were told by officials that they would not be evacuated until the next morning. “We were not equipped for an overnight stay, it was an open place, we couldn’t huddle along any walls, because that’s where the risk of landslide was worst,” Ms Dumlao said. “Many in the group were already getting hypothermia, it was very cold up in the mountains, it was starting to rain at some point, some of the climbers were already getting wet and we hadn’t eaten since 1:00am that morning. After being told, nine hours after the quake hit, that no help would be coming until the next morning, the freezing, hungry climbers were forced to make the perilous journey down the mountain. “When we saw that all the conditions were right for the rescue and yet they had made the position that they were not coming, I was both angry but also determined to make it down on our own,” Ms Dumlao said. Ms Dumlao and her travelling partner made the perilous trek, followed by the other climbers, down to Laban Rata, a small village rest stop halfway up Mount Kinabalu. “There were continuing tremors, continuing rustling of trees and continuing landslides that we could hear in the distance and it was quite fretful really, the potential of being caught in a landslide,” she said. The Malaysian government reported 13 people were killed in the disaster, and for Ms Dumlao the sight of death all around was confronting. “When I saw the corpses, lying uncollected in the rock fall, that was probably the point when I realised that things were actually very, very bad, and fear set in,” she said. Photo Australian climber Vee Jin Dumlao described the government’s response to the earthquake as a ‘farce’. Arriving at Laban Rata, Ms Dumlao saw uniformed rescuers milling around the “chaotic scene”. “They were looking rather lost really, and it was the mountain guides who did most of the work attending to the injured, strapping people into stretchers, getting ready to take them down the mountain,” she said. She said the effort appeared disorganised, and without helicopters, the rescue officers were of little help, stuck on foot and five hours away from the mountain’s peak. “They congregated in groups occupying resting spaces, sharing smokes and food that were meant for survivors,” she said. Ms Dumlao said many more people could have been helped, and deaths may have been prevented, had helicopters landed in Laban Rata. “If the helicopters had delivered some help earlier and landed in the helipad at Laban Rata, they may certainly have been able to attend to any injured people quite sooner,” she said. After seven hours trekking in the freezing dark, through treacherous rain and mountain-rattling tremors, the climbers reached the trek’s starting point Timpohon. Upon their arrival at 12.30am, the site was strewn with medics, military and media. All members of Ms Dumlao’s group made it to the mountain’s base safely. But she says emergency services let her, and many Malaysians down. “I cannot find evidence for me to respect the government who have all the conspicuous demonstration of responsibility but none of the true act of it,” she said. Photo Australian hiker Vee Jin Dumlao was stranded on Mount Kinabalu after a powerful earthquake. She says her mountain guide Jomius never left her side. Ms Dumlao said she was “so grateful” to mountain guide Jomius, who helped the trekkers to safety. “The journey we took required the engineering of the guides who made abseiling equipment from the bare resources at hand,” she said. “The mountain guides were the heroes. They risked life and limb and made some difficult decisions that ultimately saved our lives, and had neither help nor recognition from the authorities. She said she appreciated that the guides could have saved themselves much faster without the slow-moving climbers. “Yet they stayed and did what they could to meet our needs,” she said. 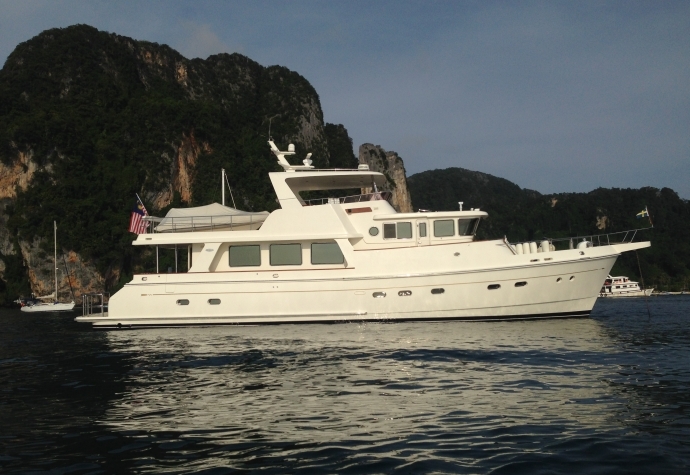 Listed at YachtFinders Global http://www.yachtfindersglobal.com/used-boats/detail/1322 and available for inspection from Singapore. Please refer to the original content located at geo.garage. From SailingScuttleButt Team Vestas Wind may likely have concluded their Volvo Ocean Race campaign when their boat was grounded on the Cargados Carajos Shoals in the Indian Ocean on Saturday night, November 29. With both rudders broken and water ingress into the stern compartment, it was a grim moment for skipper Chris Nicholson and his team. 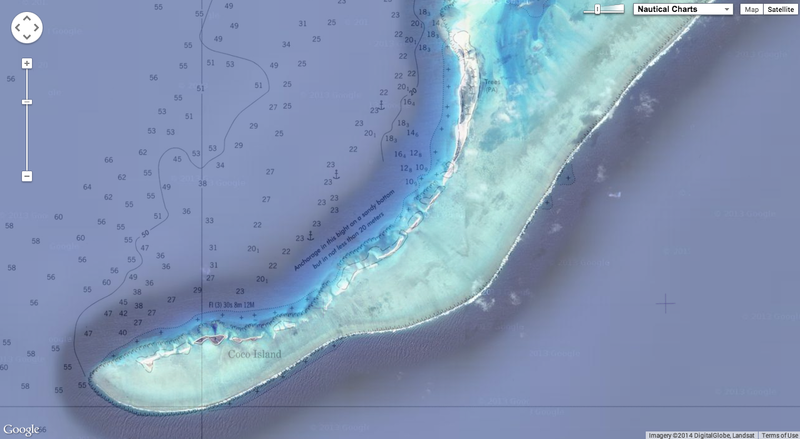 Sitting high on the reef, the crew waited until daylight, then stepped off the boat onto the reef, later to be transferred to a local rescue boat. 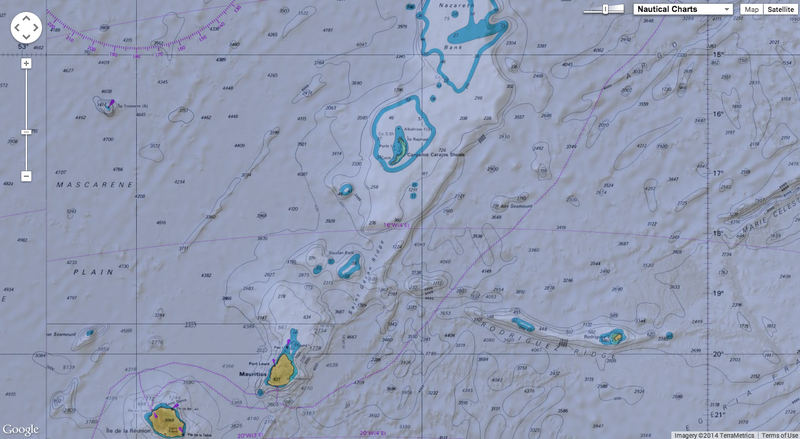 Now they will stay on nearby Íle du Sud today (Nov. 30), with plans to return to the boat on Monday to remove gear and travel on Tuesday to Mauritius (Dec. 2). Click here for the incident report. Two questions are being asked. Where is Cargados Carajos Shoals and how can a professional team have this kind of accident? 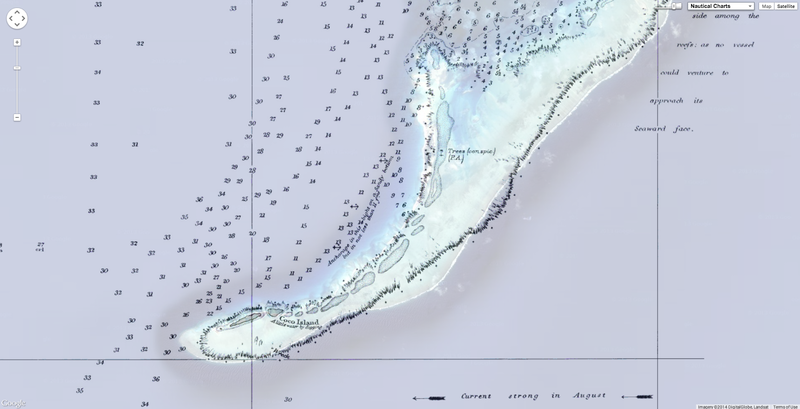 What is says in the pilot about the Cargados Carajos shoals (NGA)… no really true if we look at the official maps (overlayed on satellite imagery). 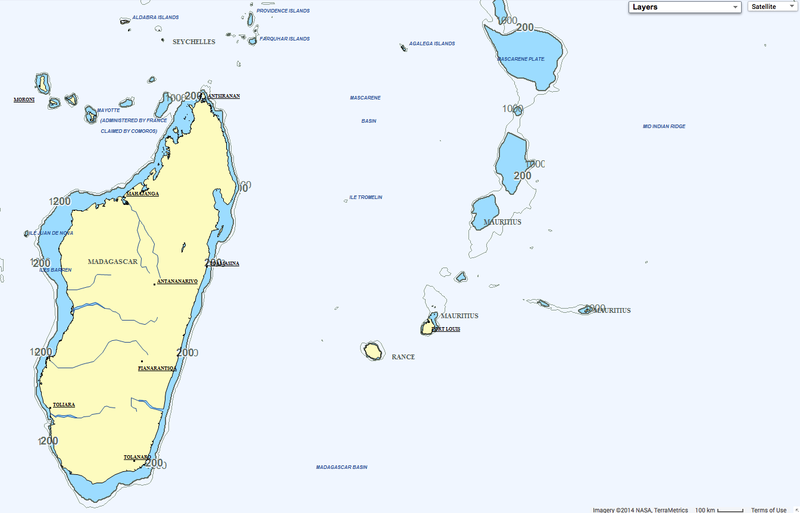 They are inhabited and belong to Mauritius, an island nation 270 miles to the southwest. 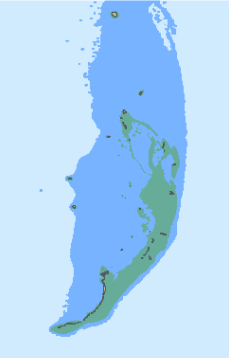 Mauritius is about 1,200 miles off the southeast coast of the African continent. As to why Vestas Wind ran aground, Vestas Chief Marketing Officer Morten Albæk is delaying comment. “The root cause of the accident is now under investigation. (However) we obviously hope to stay in the race.” A team led by the Vestas shore crew is now en route to Mauritius to further assess the damage to the boat. 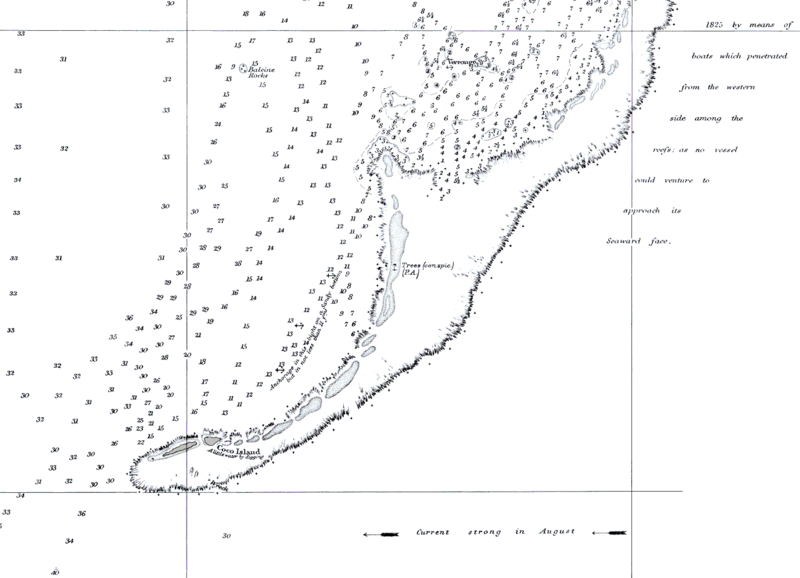 Screen of the navigation software used onboard (Expedition): with C-Map charts at large scale, showing the Cargados Carajos Bank quite clearly. 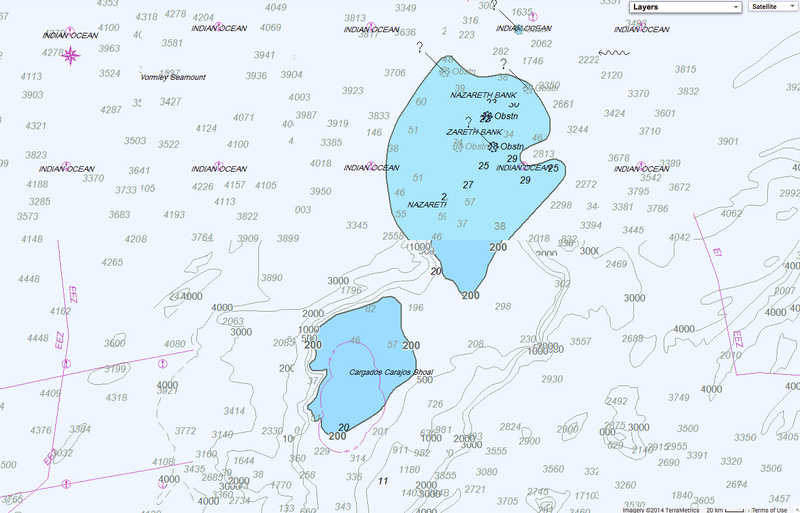 (at larger scale -: zoom) Who bothers to “zoom in” when you are in the middle of the ocean? 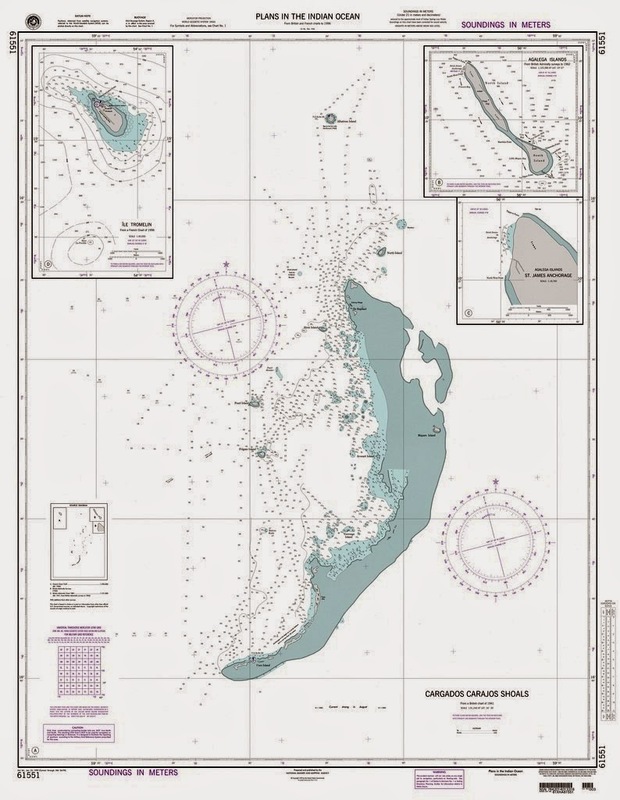 After analyzing the early information from afar, marine industry consultant and professional navigator Campbell Field provides his opinion on the incident… “Since Vestas Wind grounding there has been a huge amount of speculation and opinion as to how this happened, or who is to blame. 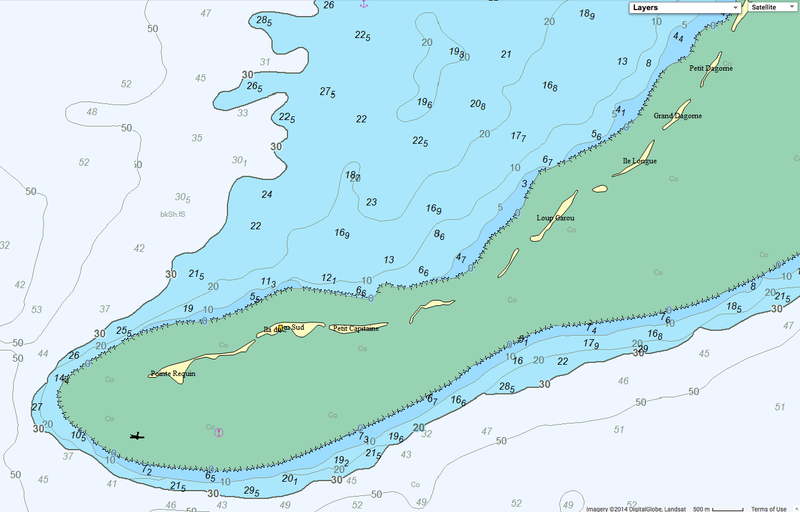 90 foot Expedition Yacht Sinks……and now the Salvage ! !